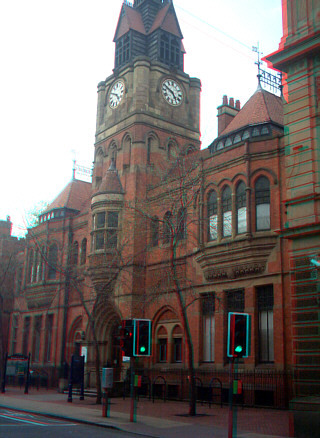 The idea behind stereoscopic images is that they convey three dimensional information to your brain - the usual way of doing this being sending a different image to each eye. 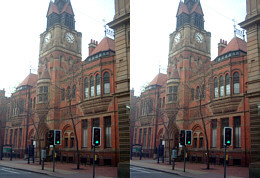 Ideally, the distance between where the original images were taken should in some way reflect the real distance between your eyes - around 60 to 70mm - but here, we have the capability to make things that are very small or very large also appear in 3D by using small or large distances respectively. There are a number of ways of doing this, one of them putting the images side by side and letting the viewer aim and focus each eye on each image. If you click on the image below, a new browser window will open up with the larger images in it. For the red/cyan image, you will need a set of red/green or red/cyan filtered glasses. To view this type of stereogram, you need to cross your eyes so that the images overlap each other. With them overlapped, you need to get them in focus. Another thing you will notice is that as you look at objects within the image that are at different apparent distances from you, your eyes will try to refocus. This is because you are looking at an image that has a varying plane of convergence (as in: 'real life') but a fixed plane of focus (as in: 'looking at a flat image'). Your eyes, since birth, have been programmed by experience to change their focus according to their convergence and you are now telling them to do something different all of a sudden. One thing that you will notice if you get too close, is that it will become fairly uncomfortable to view as you push your eyes further away from their limits. We can overcome this to some extent by having the images on top of each other. This can be achieved in the cinema or on a slide show by projecting the images (through two polarising filters) onto a silvered screen and making the audience wear polarised glasses. So as to preclude some getting the glasses on back to front, the polarisation is done at +45 degrees and -45 degrees so that they can be put on back to front (they are only made of card) without any consequences (if set to 0 and 90 degrees, each lens would be tied to a specific image and therefore it would be possible to put them on the wrong way). Unfortunately, polarisation is beyond the printed page and VDUs so another plastic glasses method is used, sacrificing some of the colour information. One thing you will notice is that whilst there is clearly still colour information there, objects that reflect colours that appear only in one eye are uncomfortable to view. The less saturated colours are better because they go through into both eyes - the NEC and Utimaco stands are such examples. One distinct advantage of this method is that the images can be larger and as the sharpness of the third dimension depends upon size, that is better (think of the lateral displacement in pixels between the front and the back of an image. If it was +16 to -16 pixels, that would be a total of 33 whole-pixel positions in the z axis. If you made the image half the size, it would only be 17 positions. Whilst the viewer can compensate for a smaller image to some extent by getting in closer, there are still only so many pixels and therefore only so much resolution on the z axis to go at. The ultimate in desaturation is greyscale so if we desaturate both images, colourize them and then superimpose them, we can get a true 3D image at the complete loss of colour. I told you something had to go but at least it is comfortable to look at. and, the red/cyan colour pair. There are many other 3D methods available and a quick look on www.google.com , searching for stereograms and how they work will show some more methods. 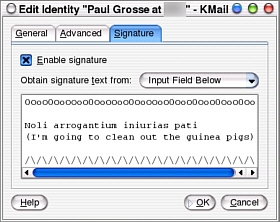 'HTML email is the best thing since chocolate ethernet cards'. 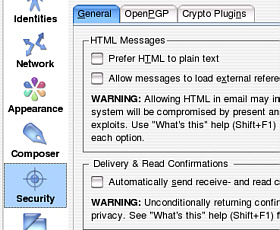 The security risks associated with html email and all of those things that run on it can often be too high. Often, the only part of the message that needs to be read is the written part - pretty backgrounds and little icons of envelopes are useless and the stuff that runs itself is potentially disastrous. If you have built the proxy server in issue 217 and use it to guard a Windows network, have a dual boot system with Linux and Windows or run two machines, one with Windows and one with Linux, you will probably be familiar with Outlook Express but also wondering if there is a more secure alternative - right-clicking on a mail, selecting properties and then looking at the source for every mail has its limitations. 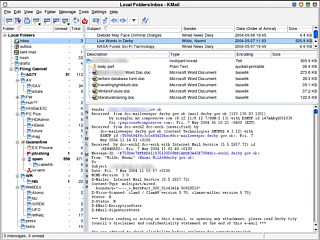 As part of KDE, KMail provides a much more secure email client and is similar to Outlook Express and pretty much any other email client to configure. The fact that it runs on Linux means that all of those nasty attachments that are designed to exploit holes in the Windows operating system and the programs that run on it will not work. Another advantage is that even if the you manage to run something that succeeds in destroying your own account, the system is still there, along with everybody else's accounts. 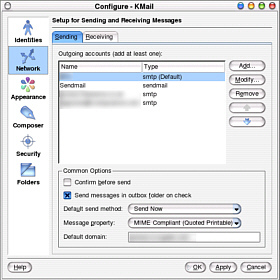 To configure KMail, click on the configure icon or, on the menu: Settings | Configure KMail. First of all, you need to create an identity. You can have several of these and use them according to your needs. 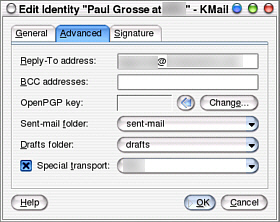 In the General tab, fill in the name and email address - if you want to have several identities, you can alter the name to reflect this. 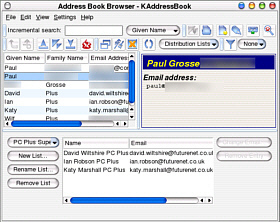 Under the Advanced tab, you can fill in the 'Reply to' address and the folders where any sent emails and drafts should go - this allows you to have separate folders for each identity so that you can keep email news group material separate from other stuff (including other email news groups). At the bottom, there is a checkbox for 'Special Transport'. Unless you have already set up a transport under networks, you should leave this alone for the moment and come back to it later. Under Network, you can add details of the various connections you want to use. Under the 'Sending' tab, click on Add. Type in your user account and the name of the host that you use. 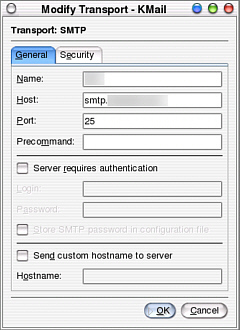 SMTP usually goes out on port 25 so unless your ISP's SMTP server is configured differently, leave it as it is. Next, click on the 'Receiving' tab and then add a new account. 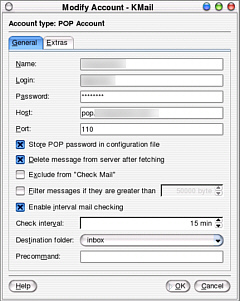 Type in the details that you need to collect mail from your pop account - you can do this with as many pop accounts as you like and configure them all to pick up every ten minutes if you want. Just type your user name, login, password, host name and you should be able to leave the port number at 110. If you have a special connection, you can configure those details under the Extras tab. Now you can go back to the identity that you created and add the special transport method you need if you don't want to have to select from a list every time you write a mail. Making it more secure to view mails. 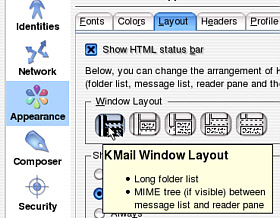 Under the 'Layout' tab under 'Appearance', click on one of the options that gives you the MIME tree. This allows you to see the rubbish that accompanies the information that you want to read - see below for a little more about this. Under the 'Profiles' tab, click on most secure and nothing will run by itself - even html mail will not load itself unless you ask it to on a one-to-one basis. Under 'Security', make sure that nothing is checked. Preferring HTML to plain text allows the sender to impose his/her ideas on how you want to read your mail - how arrogant of them. Allowing messages to load external references from the Internet means that a mail could make your firewall think that you had opened up a connection from the inside and therefore that it was all right thus circumventing your security policy. Automatically sending received- and read-confirmations undermines your security for one: because it could be used by spammers to confirm that they have a hit and therefore should concentrate their activities on a confirmed list. So, with it all up and running, you can get it to check your mail box however frequently you want, displaying the results safely in the window. The MIME tree shows you just what you have got and you can even see how much junk people send in the most insecure formats. This example is from a local authority. 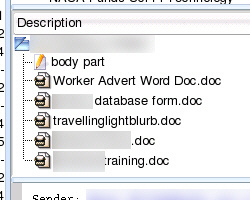 You will notice that apart from the bit I would like to read, it is full of .doc files. Even on my Windows machines, I do not run Word but even if this mail was riddled with viruses (which it wasn't) it could do no harm here. Still, you'd think that local government would know better than this. I something really has to be formatted, what's wrong with rtf or even pdf? Whatever happened to plain text? There are email clients that will run on Windows but the security on Windows is not as good as many of the free operating systems. Clearly, opening an HTML mail which could (and some do) have scripts in that are set to run when the html page is opened is not a good idea. Give me the chocolate ethernet card.